This is another treat I made for my demo. It was such a coincidence that I made so much stuff with nuts, LOL. Guess I went nuts this year. 1. Brush the ghee all over, thinly on one side, except for the egg wash corner. 2. Don't ground the peanut as fine as powder. Fine but not too fine. 4. You can use egg white instead of whole egg for sealing. 5. Don't roll it way too tight, keep the filling loose., but neatly tucked in. 6. Bake the rolls thoroughly, if not, they won't be crispy and stay crispy. You can use other nuts too, if you like. Cashew sounds good too, but peanut is very fragrant. The filling looks loose when you roll it up, but after baking it's ok. It will loosen in the mouth as you chew, but not the moment when you bite it open. If the nuts and sugar is too fine, you loose the sandy effect, but all sweet and compact. Not as nice, if you ask me. 1. Mix ground peanut with sugar. 2. 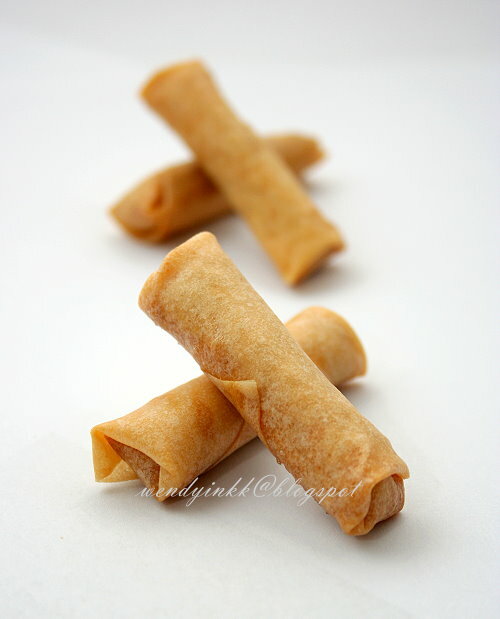 Cut each popiah skin into 4 squares each. 3. 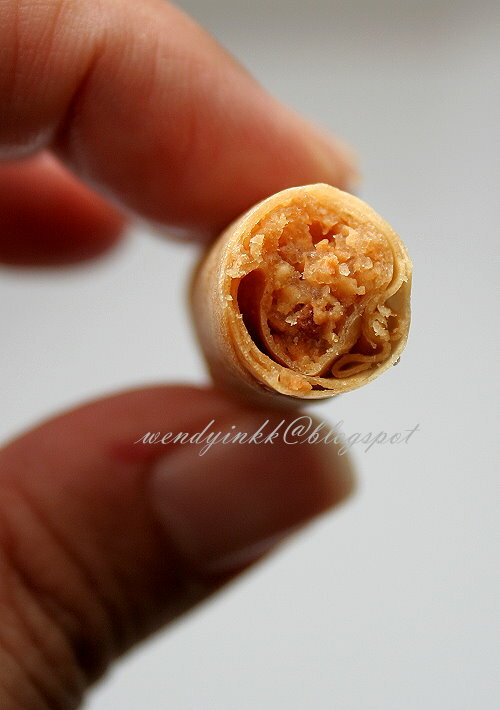 Brush surface of popiah skin with melted ghee. 4. 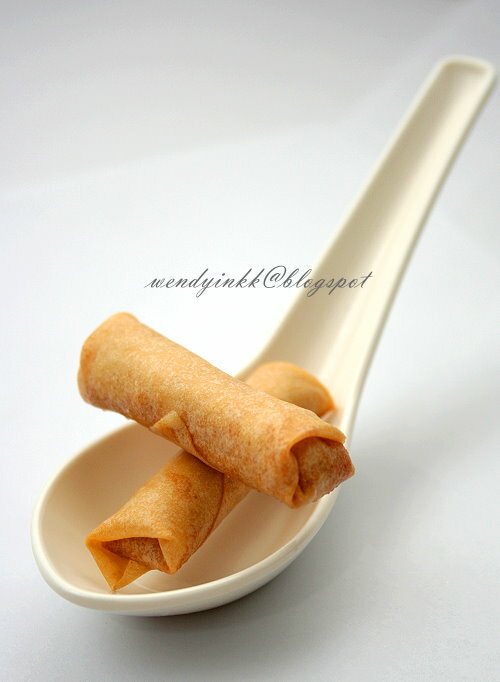 Put 1 tsp of peanut mixture onto the popiah skin and wrap up like a mini spring roll. 5. Brush the top corner with some egg and seal the wrapping. 7. Preheat oven at 160(fan)/180C. 8. Arrange the wrapped rolls onto a baking tray and bake for 15 minutes or until lightly golden and crispy. Oh my, you really making gone nuts with your everyday nutty posts! I just can't catch up as there are a few I would like to make too. This is really crunchy and crispy....I love it. LOL, hahaha, totally nut case. No I didn't. Just let them bake like that only. Lighting of the photo is so good! You are totally my idol! Shooting good photo, and have such a good cooking skill. Wow wow! So many recipes that are good for the CNY. I wonder if I can wrap the spring rolls in advance say one week? before baking them..? Can be done? This one will be very addictive leh! Pop into the mouth, crunch, pop into the mouth, crunch....Wendy, this one how long can it be stored? And generally home baked cookies how long can we store them? Thanks! oh ! This is a must try recipe. Looks great! Well done. these is nice and i am sure everybody love it. Lovely as snacks while watching my kdramas! But if I were to make them, my fimgers will fall off one by one! Lol! I salute you! Since we have no pork floss or hae bee hiam at home right now, this is a great alternative! I love that it can be baked too! this must be super yummy! May I use wanton skin instead of poppiah skin? I am not sure if wantan skin will give u the same crispness. Hi Wendy, is there a reason to use Ghee? can we use butter instead? Tried baking but it does not stay crispy. Can I fry instead or airfry? You have to keep them air tight, and if you used butter instead, it might not be as crispy.